Gentry Riggen has over 6 years of experience in crafting web and mobile applications. 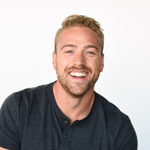 Prior to joining IMS, Gentry worked in a myriad of industries ranging from Department of Defense to a small startup building fitness related software. Gentry was born and raised in beautiful Colorado and still lives there today. When not writing software, he is spending time with his wife and son or in the gym working out.